charmcityartsmaven: “EXIT PLUTO” OPENS @ THE STRAND THEATER THIS THURSDAY! 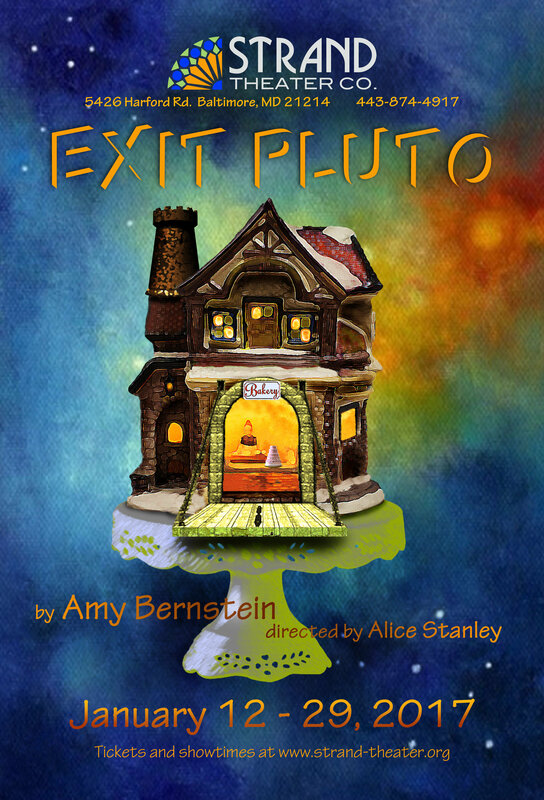 “EXIT PLUTO” OPENS @ THE STRAND THEATER THIS THURSDAY! Opening This Thursday! Join Us! Betty believes that by running her bakery like a fortress constantly under siege, she will stave off what she fears most and understands least: change. And so Betty insists that a thieving customer is sweet as pie; that the builder she has known his whole life still dotes on her confections; and that her young apprentice, Lulu, will be loyal forever. But change is a hungry beast, knocking at the door, and not even the fortress can withstand the pounding. Visit www.strand-theater.org to purchase tickets. Amy Bernstein’s plays have been read and produced in New York City; Washington, DC; Baltimore,MD; Lexington, KY; Leeds, England, and elsewhere. Amy’s full-length play, Raw, was produced by the Venus Theater in Laurel, MD, in 2015 as part of the Women’s Voices Theater Festival. She regularly participates in the annual Kennedy Center Page-to-Stage Festival and Free Fall Baltimore, and has had work included in the Baltimore Playwrights Festival. One of Amy’s one-minute plays is included in a forthcoming anthology published by Routledge Books. She has participated in intensive playwright workshops at the 2011 Association of Theaters for Higher Education (ATHE) Conference and the 2012 Inkwell Theater in D.C. A short play about 9/11 was performed at the Marble Collegiate Church play festival in 2012.